Members of the Blind Veterans Association are making the case for additional research funding for traumatic eye injuries. Stars and Stripes recently picked up a story from the Pittsburgh Post-Gazette that gave an overview of the problem and criticized Congress for its tepid response. 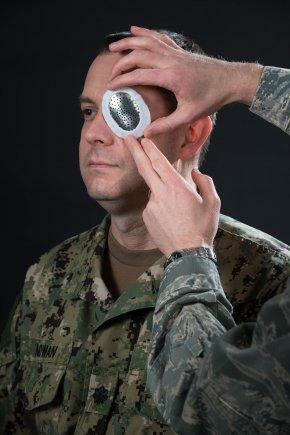 In recent years, eye wounds have become the second most common battlefield injury, second only to hearing loss. Traumatic eye injuries represent 16 percent of all combat wounds in Iraq and Afghanistan, and 80 percent of combatants with eye injuries were unable to return to duty. A 2012 study at the Johns Hopkins University Bloomberg School of Public Health estimates that over the previous decade of combat, eye injuries had cost almost $2.3 billion per year in medical expenses, government benefits and lost contributions to the economy. Yet Congress has only allocated $10 million in the current federal budget to special vision research. Tom Zampieri, a board member of the Blind Veterans Association would like to see spending more in line with the funds for treatment of other disabling injuries, such as prosthetics for lost limbs and therapies for traumatic brain injury and PTSD. Even though amputees represent a lower number of overall casualties, stories about disabled vets receiving prosthetic limbs are commonplace, because medical engineering has provided advanced devices to replace legs, feet, arms and hands. No comparable strides have been made in using technology to restore vision. This means that many veterans, who are otherwise highly capable, face a life of diminished potential and disability. Abraham Lincoln famously said that we must “finish the work we are in; to bind up the nation’s wounds; to care for him who shall have borne the battle….” That is the mission of the Veterans Administration, and Congress should provide the funding to assist in these efforts. The humanitarian benefit of restored sight is obvious, but advances in this area will also create savings as fewer vets have to rely on disability. If you or a veteran you love has been denied VA benefits, Marcari, Russotto, Spencer & Balaban can help. Our nationwide law firm focuses on getting benefits approved for deserving veterans. To learn more, call us at 866-866-VETS or contact our office online.